I’ve talked a lot about my dear friend, McCall, on Make&Do Crew. And that’s mostly because she’s the kind of friend that deserves to be written about. Today, I’m going to show you five reasons why. Since my December has included packing up one house and moving into another (read more about all that here and here), my Christmas decorations currently consist of one strand of lights laying in a heap on my nightstand. That’s it. And they’re only there because my nightstand offered the only six square inches uncluttered enough to set these breakable lights on when they were haphazardly pulled out of a box five days ago. Needless to say, I’m counting almost elusively on Pandora’s Mariah Carey’s Christmas Station to infuse my house with a little festive cheer. Fingers crossed. So of course I was thrilled when McCall sent me photos of her souped-up holiday hut and said I could share them with you. 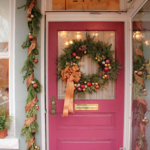 What I love about all of these DIY Christmas decorations that they’re super simple, but in true McCall fashion, they make you feel like you’re living inside a glossy Pottery Barn catalog. Really, most of these decorations could be completed in somewhere between 30 seconds and an hour. 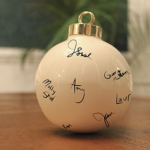 And since there’s only a smidge of decorating time before Christmas, I’d say these are just what Santa ordered. McCall calls this first idea “garland.” I personally think what we have here deserves a new name, as this is about 1000% awesomer than any garland I’ve ever seen. 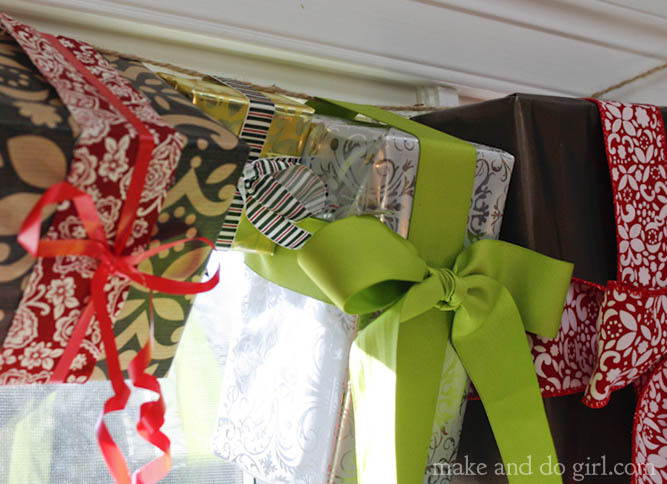 How to do it yourself: wrap random small boxes and string them together with twine. Either tape them on the string or thread the sting through the wrapping. 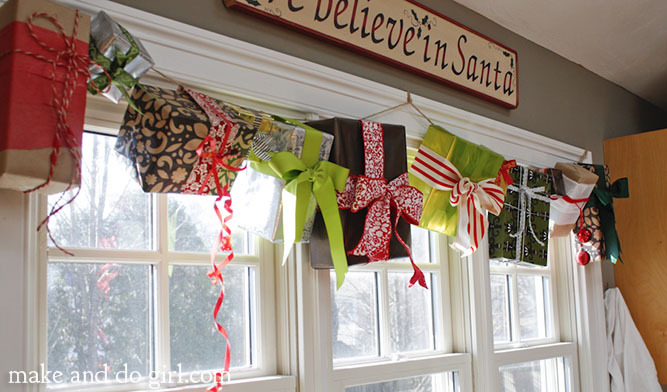 Tip: McCall says this garland works best when hung on a wall since it is front heavy and the presents will face straight down if they don’t have anything to lean against. 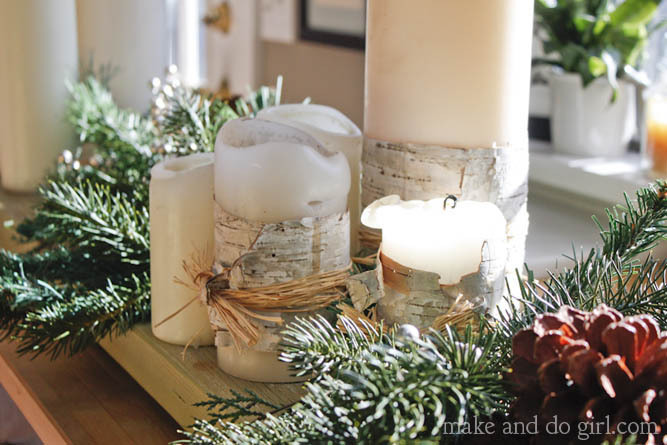 How to do it yourself: Find some bark on the ground (which is especially easy if you live in the North East like McCall does), wrap it around cheap pillar candles from Ikea and tie them off with some raffia ribbon. If you can’t find birch lying around, buy it here. This centerpiece idea is perhaps the quickest DIY decor idea and one you can execute while roasting chestnuts on the open fire. 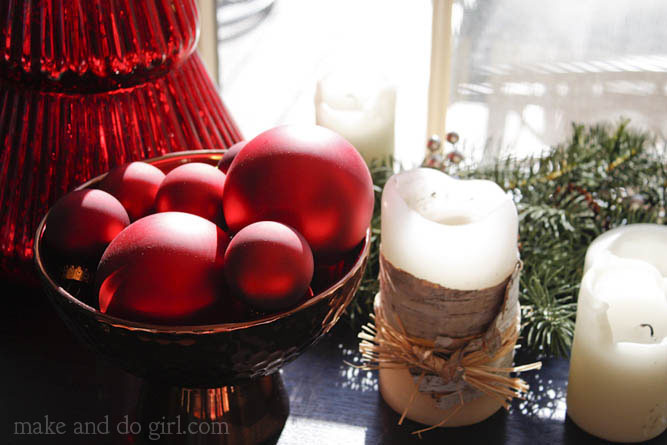 How to do it yourself: put some Christmas bulbs in a bowl or glass vase. Yup, that’s it. 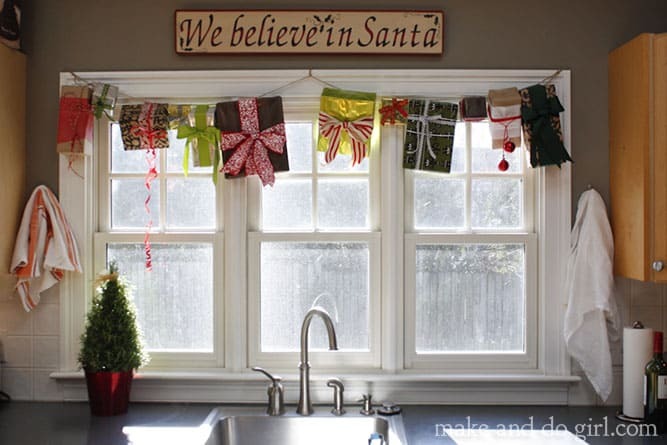 Here’s an inexpensive way to add a little winter to your window, even if you live smack dab on the equator. 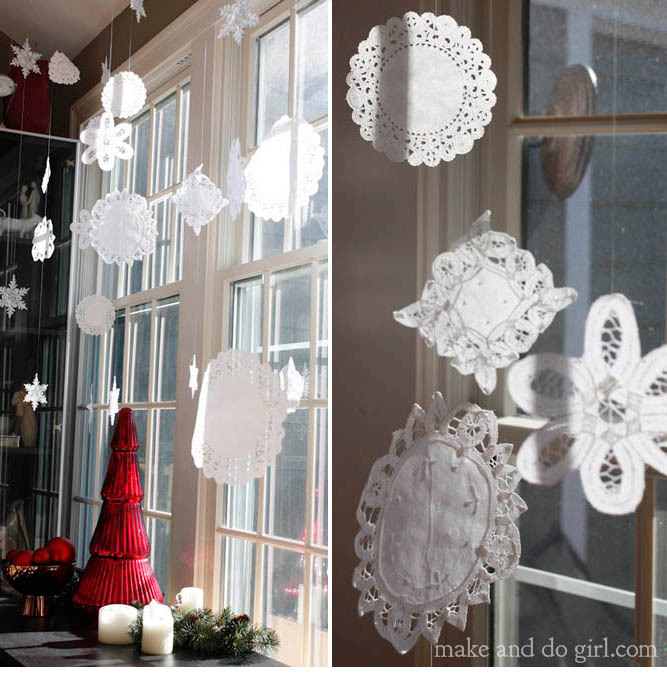 How to do it yourself: collect doilies, both paper (found at Michael’s in the cake decorating section) and crocheted (also from Michael’s and thrift stores) and other snowflake shapes (these inexpensive plastic ornaments are from Home Goods) and hang them from fishing line or clear beading string. This last idea is one McCall and I DIYed together the weekend she came to visit me. 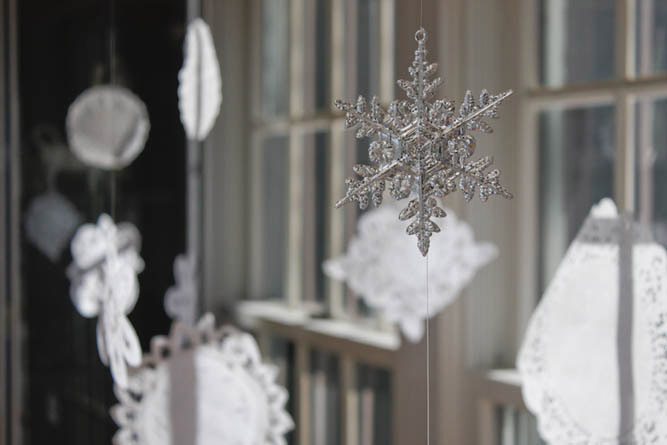 These were inspired by some mason jar snow globes we saw at Anthropologie. We decided there had to be a way to make them ourselves and it turns out, there was! I’ll share the entire tutorial later this week. In the mean time, how sad cute does this little deer look trapped in this jar? Nothing like a little plastic captivity to make you feel festive, huh? This won’t be the last you’re hearing from McCall this week either. 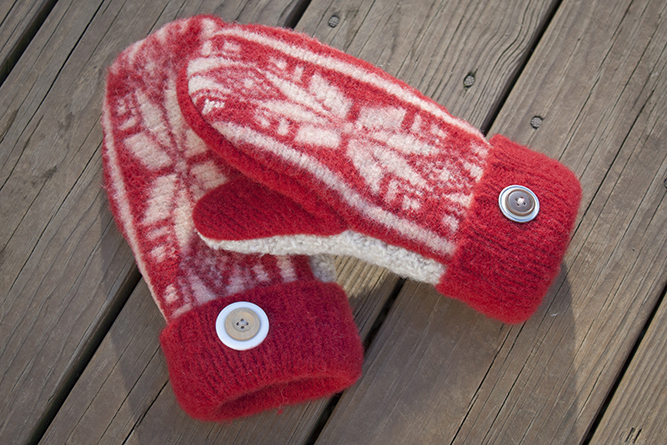 On Thursday she’ll be teaching us how to make these AMAZING mittens from a felted sweater. I am telling you, once you get a good look at these, you’re going to want to be McCall’s best friend too. Between now and then, check out her inspiring photography here. I love that gift garland. So unique and cute. I agree, Jamie! And inexpensive too! McCall’s one creative cookie. 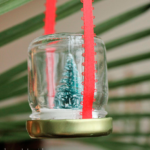 Thanks for sharing Jess, the mason jars snow globes look awesome! Both the jars and present garland are too cute! 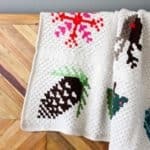 I’ll have to make both of these this holiday season. They’re both so easy too! I hope you enjoy them! 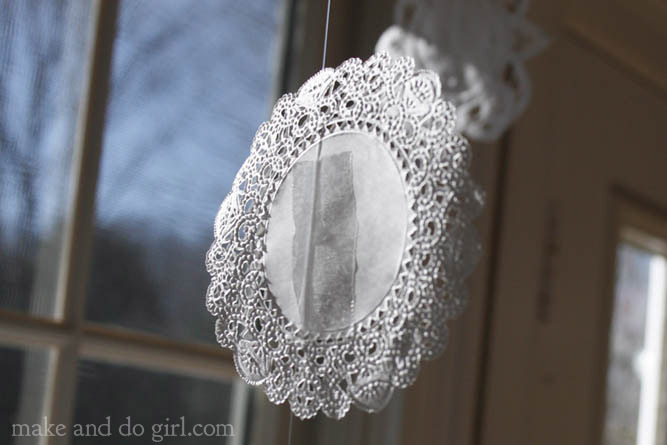 which hangs above the window or does she have a pattern for it? Thank you both for your sharing.